Training Future Champions at Frank Hawley's Drag Racing School! Jun.01.2017Hawley Continues to Train Future Champions! By Abby Werner: Frank Hawley’s Drag Racing School continues to be the best as they train two future NHRA competitors. Austin Prock and Jordan Vandergriff are currently going through a multi-year program with Frank Hawley’s and are excited about what their future in drag racing will bring. Austin Prock is the 21 year old grandson of Tom Prock, a former NHRA Funny Car driver, and the son of Jimmy Prock, a crew chief for John Force Racing. Jimmy Prock led John Force to his 16th championship in 2013 and is currently the crew chief for Robert Hight’s Auto Club of California Chevrolet Camaro SS Funny Car. Austin has experience racing Sprint Cars and Midgets, and works on the JFR cars as well. He is part of John Force Racing’s driver development program. “I’ve already been through Frank’s S/C program. Up next I’m gonna test in the School’s Alcohol Funny Car. We’re hoping to make some runs soon. We’re going to do several laps in that. And then once I get my license, I hope to start testing in a Nitro Funny Car,” explained Prock. Jordan Vandergriff is the 22 year old grandson of Bob Vandergriff, the owner of Hedman Hedders, and the nephew of Bob Vandergriff Jr., a Top Fuel driver who has raced in the NHRA for over 20 years. “It’s pretty exciting knowing guys like me and Austin Prock are the future of the NHRA. It’s amazing- I grew up going to the races, watching my uncle. I never thought that I would be the guy to be up next, and now that it’s happening, it’s surreal. Next up is the alcohol program. I am very excited. Hopefully I can win and carry on the family name,” said Vandergriff. Both Prock and Vandergriff have already attended Hawley’s S/C and S/G program and agree that Frank Hawley’s Drag Racing School is the best, and what they have already learned from Frank Hawley will be invaluable in their racing careers. Since Frank Hawley has trained many of the top competitors in the NHRA, they are each optimistic that the racing education they receive at Hawley’s will propel them to the top of the NHRA leaderboard. “What I liked best about Frank Hawley’s Drag Racing School was how Frank was one-on-one with each driver and after you made a lap he would take you back into the classroom and break down the run for you. Frank knew what mistakes you were gonna make before you even made them. It was cool how knowledgeable he was about the human body and your reaction times and your composure as a driver,” said Prock. Prock and Vandergriff came to Frank Hawley’s Drag Racing School to train from the best of the best. But the individual faith and support they have each received from Frank Hawley himself is another huge aspect of why they both loved the experience so much. 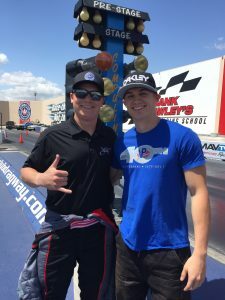 “Both of these young men come from strong racing families and are excellent examples of the future champions we train here at Frank Hawley’s Drag Racing School. I’m excited to see what they will accomplish in their racing careers, and I look forward to working with them on their journey,” expressed Frank Hawley.